Smiling Stan Hack played his entire career for the Cubs , anchoring four World Series teams (and hitting .348 in those series), and a few not so good teams. He also managed the team for awhile, and throughout his many years in a Cubs uniform, was known for having a smile on his face. 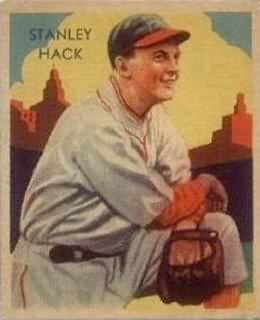 The person that noticed Stan’s perpetual smile was none other than Bill Veeck, Jr. Veeck was only 21 when he came up with a Stan Hack promotion for the Cubs in 1935. Fans were given mirrors labeled “Smile with Stan”, with Hack’s face on the reverse side. Unfortunately for Veeck, the fans used the mirrors to reflect sunlight into the eyes of opposing batters. The umpires threatened to forfeit the game if they didn’t stop, and the league banned any future promotions involving mirrors. Smilin’ Stan was the National League’s best third baseman in the late 1930s and early 1940s. The leadoff hitter batted .301 lifetime, scored 100 runs seven times, led the league in hits and stolen bases twice, and was a four-time All Star. His .394 career on base percentage was the highest by a 20th-century third baseman until Wade Boggs exceeded it in the late 1980s, and remained the best in the National League until 2001. Smilin’ Stan died in 1979. Bowa was known as “Gnat” because he was one of the peskiest little players of his era. The all-star gold-glove shortstop had his best years with the Phillies, including the year they won the World Series in 1980. When Dallas Green came over from Philadelphia to run the Cubs in 1982, he immediately traded for his former team’s leader. The idea was for Bowa to groom the young superstar in training (Shawon Dunston), work with the young infielder that was thrown in on the deal (Ryne Sandberg), and provide some veteran leadership. Bowa did the second two pretty well. He formed an excellent double play combination with Sandberg, and he did help lead the Cubs to their division championship in 1984. On the other hand, the following season the shortstop position was handed over to Dunston, and Bowa’s fiery competitiveness had a hard time dealing with that. They released him in August of that year. Bowa later managed in the big leagues for the Padres and the Phillies. They called him “Buckshot” because the shortstop sprayed hits all over the field. He was acquired from the Phillies during the 1952 season and hit incredibly well for the Cubs the rest of that year (.320 average). The following season, however, he had a much tougher time (.196 average). That turned out to be his last season in the big leagues. The Cubs had another shortstop who could handle the job. His name was Ernie Banks. As a rookie third baseman Wolverton was the number three hitter in the Cubs (then known as the Orphans) lineup. He was known for his grit and determination–resulting in more than an occasional trip to the hospital. He was hit in the face with a ball, fractured his skull looking out of a train window and smashing into a pole, broke his collarbone and more. They nicknamed him “Fighting Harry”. Wolverton played most of his career with Philadelphia. Poosh ‘Em Up Tony got his nickname from being one of the best clutch hitters in baseball history. The Yankees could always count on him to push up the runners. Lazzeri’s a Hall of Famer thanks to his contributions to those great Yankees teams of the 1920s and 1930s, but by the time the Cubs acquired him after the 1937 season, Tony Lazzeri was toast. For the Yankees Lazzeri had over 100 RBI seven times. For the Cubs, he had 23. For the Yankees he had great speed, hitting over 10 triples in seven seasons, and stealing more than ten bases in eight seasons. For the Cubs he had zero triples and zero stolen bases. Lazzeri played in 54 games for the Cubs in ’38 as a backup infielder and pinch hitter. He got two at-bats in the ’38 World Series loss to his former team, striking out once. (By contrast, in the ’32 World Series as a Yankee, he hit two home runs against the Cubs). The Cubs were swept in ’38, and Lazzeri was let go after the season. He played one more season in New York with the Giants and Dodgers before retiring. Tragically, just a few years later, Tony slipped and fell at his home when no one else was there. He was found dead from the head injuries he sustained in the fall. He was only 42 years old.